Before we begin, I have a minor confession... this isn't a guide for painting walls in one minute. I just needed a catchy title to grab your attention. 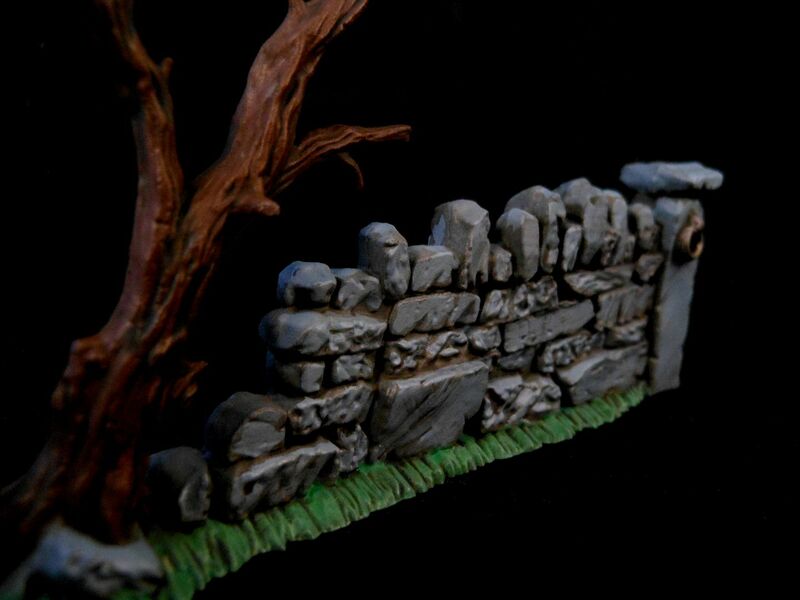 However, this is a guide for an incredibly fast way to paint any stone scenery for tabletop miniatures games, including houses, ruins, statues, and pillars, so I thought the title was close enough. And, you know... it's a painting guide... I'm allowed a little creative licence, aren't I? This is only my second painting article, and I'm still playing with the format. My first effort was a bit difficult to follow, and the pictures weren't great. Let's see if I can do better this time, as we step through the process for painting a wonderful wonderwall. Why are we painting a wall? Because Games Workshop's Age of Sigmar skirmish rules hit stores yesterday, and while I'm waiting for my copy to arrive in the post I thought it was time to finish off some of the old scenery bits I had lying around. 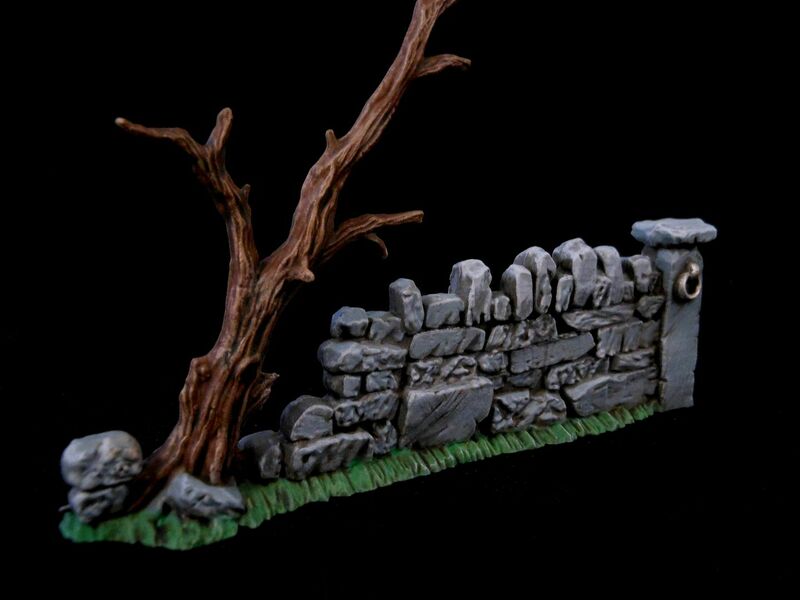 This is actually a section of wall from the bloody lovely Fortified Manor kit, which I've had for years. The painting process for this component is very simple, so if you already have experience with painting miniatures, you probably won't find anything new or interesting here (sorry!). The first thing I did was give the model a primer coat of Uniform Grey spray. I'm a big fan of coloured primer. Seriously, even if you don't want to paint your miniatures, give them a little spray with a suitable primer. Your orc army is going to look so much better with a green primer and an ink wash than it is as a horde of classic Games Workshop grey plastic. Next up is the base coat. 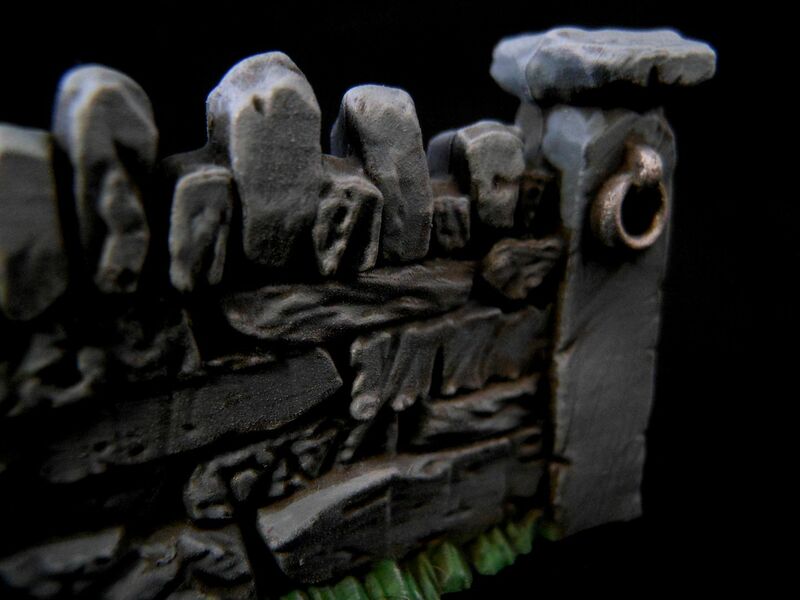 My model comprises the stone wall with a small metal ring, the tree, and some grass. The primer coat has already dealt with the wall, so I just had to apply a flat base coat of Oak Brown to the tree, Greenskin to the grass, and Gun Metal to the metal. You don't even need to worry about being too careful here. At this point you have something that looks a little bit like it came out of a He-Man playset. It's what I call the Heroclix look. The colours are bright and flat, and while the model certainly looks much better than it would with no paint, it's very easy to improve things with a bit of washing. Army Painter washes come in three varieties. Strong Tone is a general-purpose tone with brown pigment, Dark Tone has a black pigment and gives sharper definition for things like metal, and Soft Tone has a much lighter pigmentation that is more suitable for light-coloured models, and clothing. I used Strong Tone for the wall and the tree, but switched to Soft Tone for the bit of grass. I'm not sure it made that much of a difference, if I'm being honest. Once the washes were dry, I painted Uniform Grey onto the flat surfaces of the stones to bring out the detailing and stop the piece looking too dark. At this stage you can call it a day and put the kettle on, but if you've already got out your paint brush, you might as well add some finishing touches. 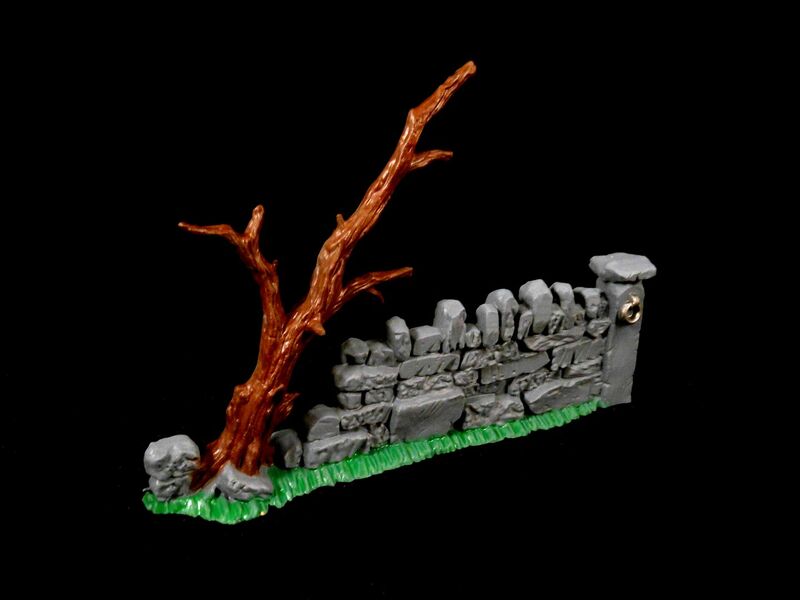 I drybrushed the grass with Goblin Green, the tree with Monster Brown, and the stones with Ash Grey. Finally, I layered on a touch of Plate Mail Metal on that ring in the pillar. And that's it. 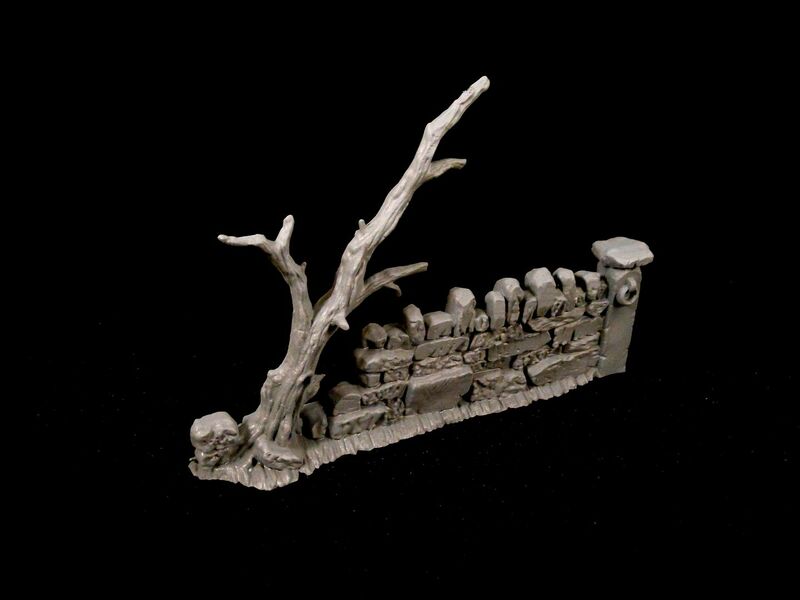 Super quick, super easy, and more than adequate for filling up a battlefield for your Age of Sigmar skirmish games. All of the paint and accessories used in this painting guide are available online and from good hobby stores.